When you mix ice with pavement and then add a car into it, what do you get? CHAOS! Icy road car accidents usually happen from a mixture of surprise and inexperience. 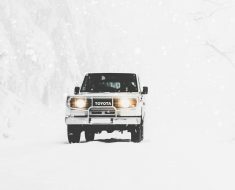 In warmer states, especially, a sudden snowstorm can mean absolute mayhem, as drivers do not know how to navigate snowy roads, and the infrastructure is not in place to salt and plow the roads. But sometimes a wintertime accident goes from unfortunate to just plain crazy, like you’ll see below. One lesson to take from all this mayhem…accidents are crazier when set to techno music. Sounds like some sort of festival, doesn’t it? It is a festival every time this southern state gets down to freezing level on the streets – a festival of bedlam! We love the way the Weather Channel camera guys just sit there filming the craziness – how about throwing some salt down, Fellini? In this video from Poland, various cars try to make it up (or down) a snowy hill with a steep 12% grade. It gets worse and worse, although the excited dialogue by the camera guys make it funnier and funnier. Couldn’t they stand at the top of the hill and warn people? You can’t go anywhere in a tunnel full of ice. It’s like fighting in a basement: where you gonna run to? Nowhere. One word: SALT. Another word: SAND. Still another word: GLUE. This icy road in Tennessee is a double danger, as it has a stoplight in the middle of the intersection. After multiple cars pile up, things get worse when they bring out a yellow caution truck, pointing in the wrong direction. What’s crazier: the people who hang out their doors trying to slow down a car, or the woman who sits down in the road right in front of a sliding car? Hopefully these folks have auto insurance (if not life insurance!). This rollover crash would have been much worse if there wasn’t snow for a buffer. Then again, without slippery roads it never would have happened at all. Snow: You can’t live with it, you can’t live without it. Do you feel protected by your SUV? Well, you’re not! This video shows that 4-wheel drive rendered completely useless by a long, icy hill. The only protection this driver has is supernatural, as he somehow manages to avoid running into anything during his long, perilous slide. We think the first driver in this video has played a little too much Grand Theft Auto.